Last week, we received the first four episodes of season 3 of Game of Thrones to review, courtesy of HBO. While our individual episode reviews and coverage will be held until the corresponding episodes air, it has become something of a tradition to share our general impressions of those early episodes. We did it for the first season, and we did it for the second season, so it seemed only right to do it again. The process of discussing even vague impressions will probably reveal some semi-spoilers, so reading on isn’t going to be a good idea if you prefer to stay unspoiled! But lets just give a general summing up first, and get into the nitty gritty after: these four episodes are on the whole quite good; not perfect, but they may well be the strongest first four episodes as a whole for the series to date (certainly, they’re stronger as a unit than last season’s first four, though none of them are as good as “What is Dead May Never Die”). Some of our biggest fears going into this season seem, so far, to be unfounded. But there are some issues, such as the fact that a number of the anticipated new characters are rather underwhelming when they finally hit the screen and that there are one or two (largely invented) storylines that don’t really feel like they’re gelling for us. Still, each subsequent episode goes from strength to strength, each one better than the last. So why do we feel cautiously optimistic? We recall that last season, too, the third and fourth episodes impressed us the most and left us pretty excited about what was to come… and then the cracks started to show and real problems developed that led to some major disappointments. Four episodes in a show like this is not enough to really gauge how the rest of the season will be, especially in terms of how well they’ll translate what’s in the novels to the screen. Now, on to some more specifics. Lets get the first thing out of the way: the first pair of episodes are a bit languid in their pacing, more than we would have expected. This isn’t entirely a bad thing—it’s partly due to some more judicious efforts to only visit stories when there’s something substantial to show, with scenes generally feeling a bit longer than they did in the first pair of episodes of the second season. Some characters do not appear at all in the first episode, whereas the season 2 opener felt obligated to drop in on every single storyline of note, to its detriment. But on further reflection, we realize there’s more to it: it’s an issue both of structure and the pitfalls of adaption. If you’ll recall, we finished the last season with certain events: Jaime and Brienne on the road to King’s Landing, Samwell trapped by an approaching army of wights led by White Walkers, Robb Stark and Talisa getting married. All fairly significant events, things that are exciting… but none of these things happen (or at least are revealed) in A Clash of Kings. We are left with Catelyn holding a sword over Jaime, the last we know of Samwell (who isn’t a POV in that novel) is that he’s kicking his heels at the Fist of the First Men, and all we really know of Robb is that he’s been winning many victories in the west but that something may have happened that’s going to destabilize his alliance with the Freys. And then A Storm of Swords opens with the chilling prologue ending with the terrifying triple horn blast revealing that Others are approaching, and then you turn the page and for the first time ever “JAIME” greets you as a POV character—to the shock of many, many readers—and we learn that Catelyn has sent him away with Brienne. And then not that long after Robb returns from the west, clothed in triumph… and newly married. It’s one shock and surprise after another that opens A Storm of Swords, and while the actual events of note may be few and far between in the early chapters (because, just as with the show, the first chapters tend to be about re-establishing the situation), there’s this air of excitement and novelty and surprise hanging over it that makes it all feel propulsive and gives it a momentum that carries readers through the setup. By using every one of those moments, by placing them all in “Valar Morghulis”, the writers set themselves up for an opening to the new season that couldn’t really live up to that sort of energy. Fans have had months to just accept Robb’s married, that the Others are attacking the Night’s Watch, that Jaime and Brienne are traveling through the war torn riverlands. There are, basically, no real surprises in the first pair of episodes because of this, and that may be the leading reason for the feeling that these first two are particularly deliberate and slow in their pacing. Yet the first pair of episodes feature a number of very good scenes and some great pairings between actors—Charles Dance and Peter Dinklage, Nikolaj Coster-Waldau and Gwendoline Christie—that are a joy to watch. It may not feel very urgent, but it feels very coherent. All four episodes are helped along by the excellent direction and photography; alone, these qualities make it one of the top flight dramas on television, as they’ve often done. HBO has been a place where some of the best directors in television have had a chance to make their mark on HBO’s shows, and it shows this season. We can’t wait to see Alex Maclaren’s episodes, or Alik Sakharov’s episode 6, titled “The Climb”. But this is all something of a given at this stage, as with any HBO production. It looks gorgeous, it looks expensive and polished, it looks consummately professional—you really can’t expect anything else. We might quibble about costuming or set choices at times—the weird mish-mashes that Michelle Clapton or Gemma Jackson sometimes come up with don’t seem to have a plausible, organic development from the surrounding cultures—but that the production team is giving the show 110% of their abilities isn’t really in question. The slow pace of story in the first couple of episodes is not helped by something that did surprise us, and disappointed us a bit: the much anticipated new additions to the cast are ... fine. That’s all. But for many readers, characters like Tormund Giantsbane, the Queen of Thorns, and Mance Rayder leap off the page, are in their way larger than life and colorful. But on the show, at least in these first episodes, everything is rather toned down. The intensity we saw in Kristofer Hivju from that image of his climbing the Wall is, indeed, in his performance. But so far, in these episodes, it’s pretty much all there is: he’s an intenser, more serious Tormund, who doesn’t make wild implausible boasts, who laughs ... but only once, so far, really. Mance Rayder’s introduction is much more low-key in the show as well, dispensing with his penchant for song and women and outrageous exploits like scaling the Wall and sneaking into King Robert’s train when he visited Winterfell. CiarÃ¡n Hinds does what Hinds does best: give weight and gravitas and an air of command ... but there’s less of a sense that he drinking life to the lees in his portrayal, and that’s a shame. He doesn’t seem all that different to Simon Armstrong’s Qhorin Halfhand, and that’s not right at all. And then the other anticipated character, Olenna Tyrell, played by the estimable Dame Diana Rigg. What can we say, other than perhaps that with Dame Maggie Smith ruling the roost on Downton Abbey, the Queen of Thorns had to have a few barbs taken out to make her just different enough to not lead to immediate comparison? The show’s take on Olenna suggests she’s a bit impatient, a bit harried, a bit cynical. Perhaps it’ll become a bit more vivid later on, but right now it feels… well, toned down. Again. Truth be told, we think this is probably a deliberate choice by the writers, and not just the fact that four episodes and a few minutes haven’t been enough to established these characters. Things that are larger-than-life, that are perhaps extreme, are regularly filed down and made a bit blander on the show. The show runners may have found these aspects of the characters to be too exaggerated, too cartoonish, to work on the screen but I do find this rather odd. It’s not as if all the characters are written so “large”—each area of the story tends to have one or two, to give some color, to provide some humor or a sense of something epic, one might say; sometimes both at once! There’s a reason why these characters are popular with readers. Would they not have translated to the screen? I find it hard to believe. Past shows have given us many outrageous, larger-than-life characters who are weird or crazy or funny enough to stand out. I have to repeat that there’s nothing wrong with the performances or the characters. Scenes remain watchable, and sometimes fairly interesting . But one can’t help but think that some of the zest of the novels has been drained out of them. This isn’t to say all the new characters seem a little drabber than one would have liked. Paul Kaye as Thoros of Myr actually contains more than a little Tom o’ Sevens in his portrayal so far, and he’s very charming to watch. Richard Dormer as Beric Dondarrion conveys Dondarrion’s adamant, weary idealism and call for justice very well indeed. Dan Hildebrandt as Kraznys does a terrific, scenery-chewing job as a sarcastic, arrogant slaver (helped a great deal by David Peterson’s work on the Valyrian language, which seems to feature some changes between how someone might pronounce it if they were speaking High Valyrian and how they might speak it if they’re from Slaver’s Bay). And Noah Taylor as Locke—one of the actors who were among the very last acknowledged by HBO—is very good indeed, as you would expect from such a talented actor. His character may be largely invented, may be in many ways a toned down Vargo Hoat (another exaggerated, larger-than-life character—and one who many fans consider very memorable! ), but he conveys a dark, sinister quality that makes him memorable. It’s not entirely inappropriate that, for some reason, he looks just a bit like Count Ruggen in The Princess Bride—Christopher Guest provided a memorable turn as well, playing a consummate villain. On the other hand, there’s a scene involving one of the established characters, Catelyn Stark, that has been dubbed as being tantamount to “character assassination” by Jace Lacob of the Daily Beast… and while I wouldn’t go quite that far (Linda would), that may just be because they’ve diminished this character (my favorite in the series) so much over the course of the two previous seasons that I just don’t really have the energy to be as outraged as I once might have been. I’ll leave more discussion of this for the analysis of the second episode, however. Episodes three and four, I won’t say too much about, beyond the fact that ... yes, it gets better from episode to episode, and each of these have very strong endings, and all in all they are quite eventful. They also allow some of the cast members to truly shine, in a way that leaves us excited for the continuations of their stories. In fact, to go further about just how good these endings are, and how solid these first episodes are in general, some of you may know how disappointed Linda was in the finale last season. She’s had—and continues to have—some pretty strong views on the adaptation. 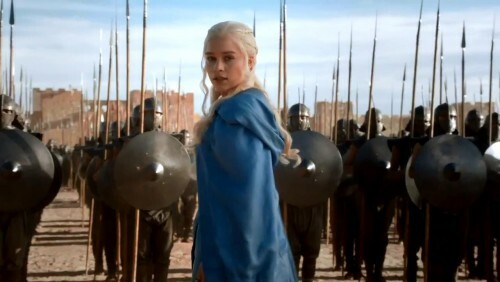 But to her surprise, she found one particular storyline this season—Daenerys’s—is perhaps somewhat redemptive of the hash they made of Qarth last season (some might find “somewhat” to not be all that much, but this just shows how strongly she hated what they did with the previous season!) The finale for episode four gave us both goosebumps, and in a good way. It was fantastic, almost exactly as we envisioned it. But will the rest of the season live up to the promise of those two episode finales, and the scenes leading up to them? We’ll have to wait and see. We keep looking back at our impressions for the second season, and then we look at our summing up of the whole of the season after all was said and done, and it’s rather startling the way our early optimism about some of their choices gave way to disappointment and frustration over some of their choices. We can only hope that this season will hew to a better, more satisfying course.